It’s doubtful that many voters care as much about Hillary Clinton’s State Department emails as reporters do. They’re probably not too wound up over the foreign contributions flowing into her family foundation, either. Cumulatively, though, these latest headlines about Clinton, along with other stories sure to come, reinforce her vulnerabilities as a candidate. Democratic primary voters are about to be reminded on a semiweekly basis of what left a lot of them so ambivalent about Hillary in 2008 — namely, the perception that the Clintons are like an unregulated industry within the party, impervious to scrutiny and contemptuous of anyone who would get in their way. And this is why, if I were Joe Biden, and if I still harbored designs on the Oval Office down the hall, I’d be inclined to ignore what the insiders were saying. I’d run, and I’d run now. I wrote a few weeks ago about the concerted effort to make Clinton her party’s nominee by acclamation and why I found it disturbing. As I said then, she might well be a good president, and possibly even an inspiring one, but there’s just something unseemly about the liberal reformers of the ’60s generation, men and women who fought to create a more democratic nominating process back in the day, now trying to back down anyone who would challenge the establishment’s candidate. The question you hear most often from skeptics, though, is who that would be. There’s Martin O’Malley, the former Maryland governor, who apparently went after Clinton with a jab at “triangulation” last week, but who hasn’t yet introduced himself to most voters or offered any real argument of his own. There’s Jim Webb, who would probably have a better shot running as an independent. There’s Bernie Sanders, who’s an avowed socialist, and Elizabeth Warren, who sounds more like a Jacobin. And then there’s the 72-year-old Biden, who is mostly left out of this conversation — not because he hasn’t repeatedly signaled an interest in running, but because the handicapping crowd has never taken him all that seriously as a foil to Hillary. 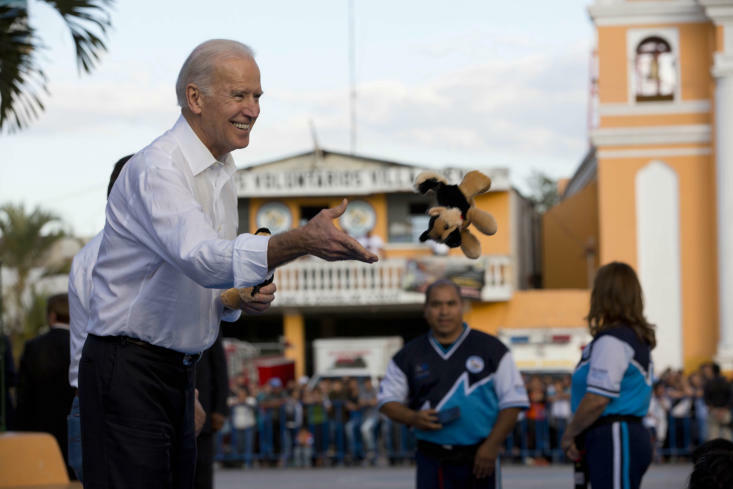 Biden has a well-known tendency to get caught up in the moment and say things that are impolitic or even partly untrue, which in Washington tends to make you a figure of ridicule, though in most other places it’s known as having a pulse. The accepted wisdom where Biden is concerned is that you can’t have two establishment candidates representing continuity from the same administration, so the best he can do is to wait on the sidelines, keep his options open and hope that maybe Hillary decides to do something else in the twilight of her life, like bring a football team to Los Angeles, or anchor the “Nightly News” on NBC. Biden’s instincts have to tell him something different, though. After 40-plus years in Washington, he has to know that no one ever really gets plucked off the sidelines when the opening arrives; you have to create the opening yourself. He has to know, too, that the insiders are almost always wrong, and the further out from an actual election you are, the more wrong they tend to be. Biden is a better candidate than most pundits have ever given him credit for. Yeah, he’s sloppy and meandering and says some nutty stuff. But that’s all part of being genuine and three-dimensional, which may be the most valuable trait in modern politics and not a bad contrast to Clinton’s robotic discipline. Not incidentally, Biden is especially popular in Iowa, where he first campaigned for president in 1988, and where he retains unusually strong ties. (The Clintons, you may recall, have never met with great affection there.) I remember being struck, in 2008, by the regularity with which Iowa Democrats told me that Biden was their second choice and would have been first if they thought he could actually win. Biden’s a middle-class champion who makes the case for economic fairness with more conviction than Clinton and less vitriol than Warren. He’s a serious thinker on foreign policy who opposes rampant interventionism without sounding like a pacifist. He more than holds his own as a debater. And Biden has nothing to lose by making one last run before riding the Amtrak back to Delaware for good. He’s already been through the unthinkable death of his first wife and infant daughter in a car crash in 1972; a trumped-up plagiarism scandal that very nearly ruined his political career in 1988; brain surgery that threatened his life later that same year. There’s nothing the Clinton machine can do to the guy that hasn’t already been done. But the main reason I’d tell Biden to run now is that you can’t actually know the shape of the Democratic field unless and until you jump into it. And that’s because very few people on the planet — possibly only people named Clinton — know what’s really in Hillary’s mind, and in her stomach. We know this about Clinton: She wants to be president and is building a formidable organization to make it happen. She doesn’t see any adversary who would be a serious obstacle to the nomination, and the insiders pushing her to run insist she won’t have to worry about one. Of course she seems 100 percent determined to run. If you’d offered that same deal to Al Gore in 2004, or John Kerry in 2008, or Mitt Romney last month, any of them would have grabbed it in a heartbeat. But if a Biden gets in the race, suddenly that calculus is slightly different. Now, if you’re Clinton, you have to ask yourself: Are you really up for slugging it out in all those primaries all over again, with the nonstop debating and parrying and standing in the bitter cold at 5 a.m., all with the very real chance that you could lose? Do you really want to risk your hard-won standing as a stateswoman on a bruising campaign against the only politician who has a stronger claim to Obama’s legacy among liberal voters? The answer is probably yes, that Clinton’s a candidate, serious opponent or not. But there’s no way for Biden to be sure of that unless he forces her to make the choice. Just as important, there’s probably no way for Clinton herself to know until the gut check is real. “I’m in it to win it” was Hillary’s garish bumper sticker when she entered the 2008 race. Her party deserves to know that she isn’t running again just because her path is clear. And Joe Biden has more than earned the right to stand in it.